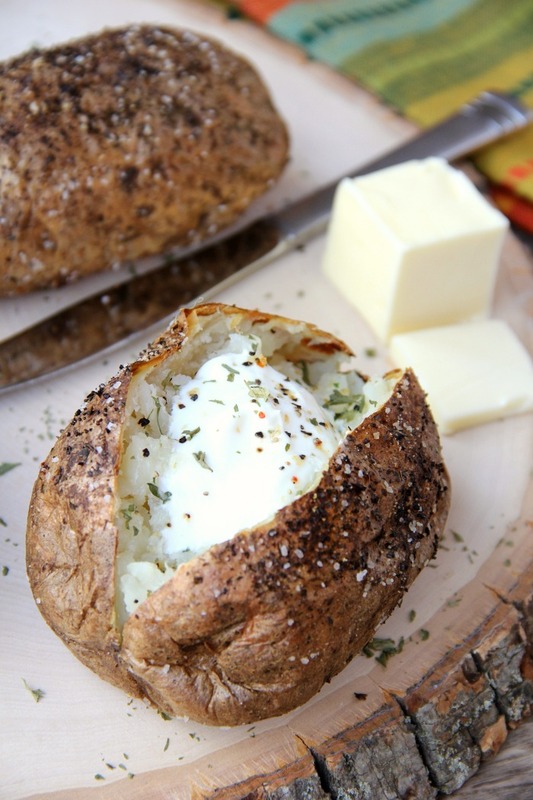 Easy Air Fryer Baked Potatoes – Tender, delicious baked potatoes with a crispy, flavorful skin. 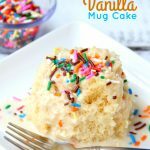 You’ll never go back to microwaving or baking in the oven again! Da, da, dahhhhh!! 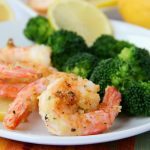 It’s another air fryer recipe! Oh, don’t be so surprised. I’m officially naming January – air fryer month. At least it is in our house. I mean what CAN’T an air fryer make?! From chicken to shrimp, to corn on the cob. . .and now baked potatoes, I’ve been having all sorts of fun with my air fryer as of late! 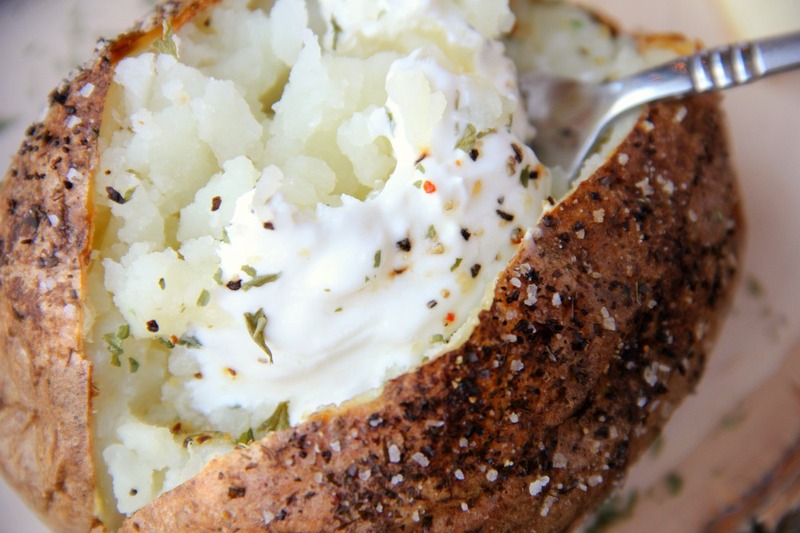 This baked potato deliciousness starts with a little olive oil and lots of seasoning. I don’t know about you, but I’m that person that eats the skin of a baked potato. Do you? I think the skin holds some of the best flavor! The combination of some salt, pepper and garlic powder make the skin pretty irresistible. So, let me just address the elephant in the room. These are some REALLY BIG baked potatoes. I get it. I cooked these babies for about 45 minutes. They certainly would have taken longer in a traditional oven. A “normal-sized” potato takes about an hour of baking time in an oven preheated to 400º Fahrenheit. With an air fryer you can usually cut that time in half. Can we talk about the skin just a little bit more? It’s so crispy and delicious. The crisp-factor is unlike anything you could ever achieve in a microwave or oven. Crazy good. And after you fluff the potato, pile on the butter, sour cream and a few extra shakes of seasoning, you’re definitely in business. There’s no going back. I’ve officially become addicted to my air fryer and I apologize (well, kind of). 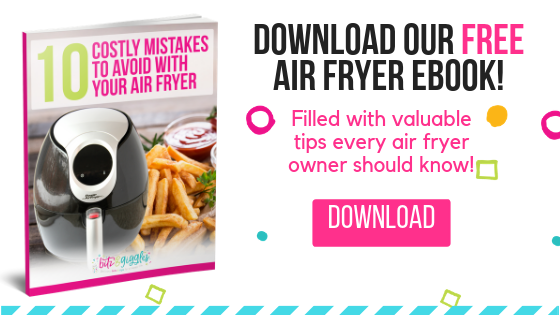 That’s not to say you won’t be seeing more air fryer recipes popping up on the blog. In fact, you may just want to brace yourselves because there are several more coming your way. I plan to use this new gadget all the way through spring, summer and fall. 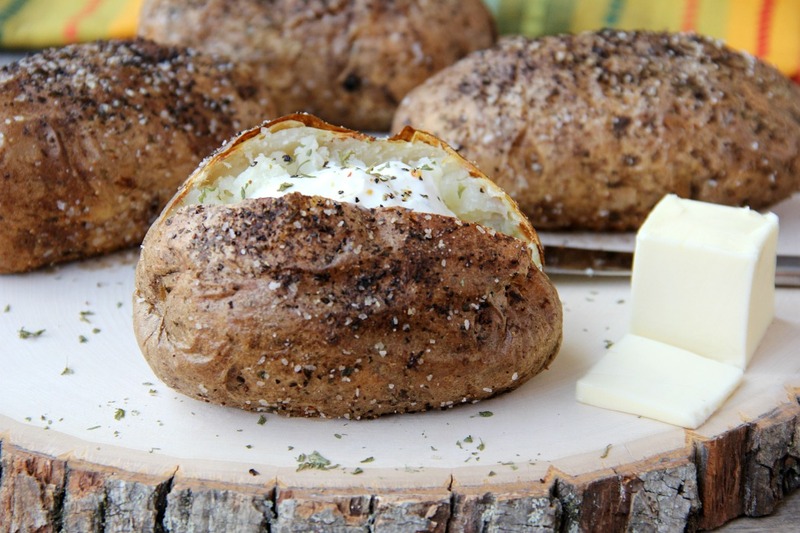 Tender, delicious baked potatoes with a crispy, flavorful skin. Rub potatoes with olive oil. 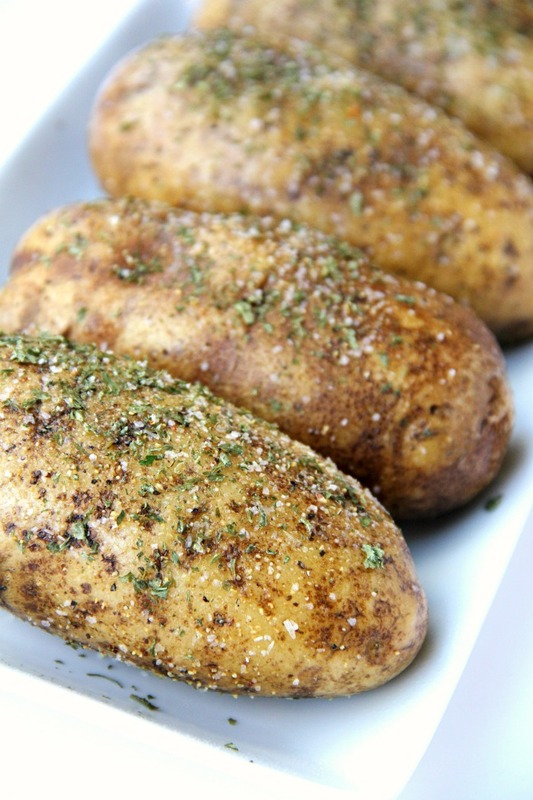 Season potatoes with salt, pepper, garlic powder and parsley to taste. 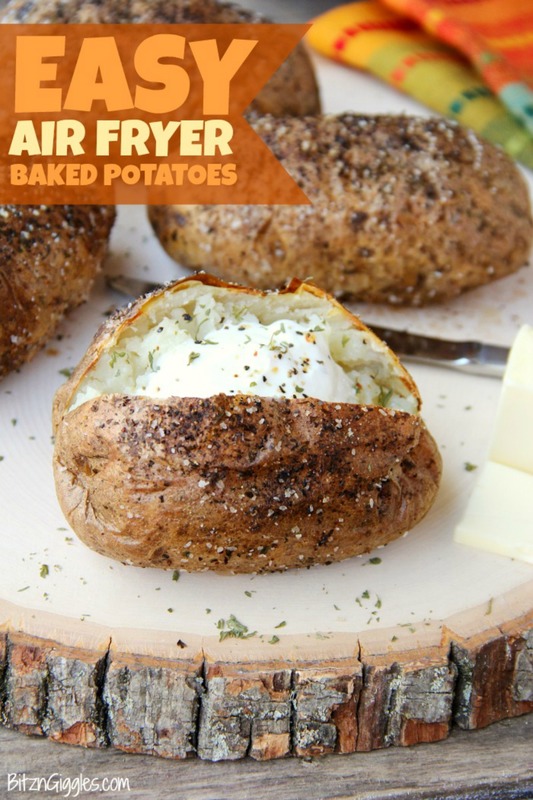 Place in air fryer and cook at 400 degrees for 40-50 minutes (depending on size of potatoes). Slice potatoes lengthwise; using both hands, pinch each side of the potatoes, forcing them to open up, forcing the inside of the potato up. Place 1 tablespoon of butter in each of the potatoes and finish with a dollop of sour cream if you’d like. My potatoes were quite large so I cooked them for 45 minutes. Looks yummy!! Can’t wait for more recipes! Hi Kim! I hope you try the baked potatoes. More recipes coming for sure! I have tried potatoes twice and both times after what I believe cooking time total of 40 min they were not done. My cooker say 390° and they were not huge, but they medium. What could I have done wrong? Opening my fryer too often maybe? Gosh, I’m not sure, Beth. That should have been enough time especially for medium-sized potatoes. Do u poke holes in the potatoes? You can but it’s not necessary. What if you have 2 potatoes? That’s fine. Just follow the same instructions and adjust the ingredients as necessary. Best baked potatoes I’ve ever had. Husband agrees. Better than a restaurant baked potato. Thank you for the recipe. I didn’t pierce my potatoes before air frying them. You definitely could. So glad you enjoyed them! It’s not necessary to flip, but if the potatoes are larger, it could definitely help to ensure they’re cooked through! 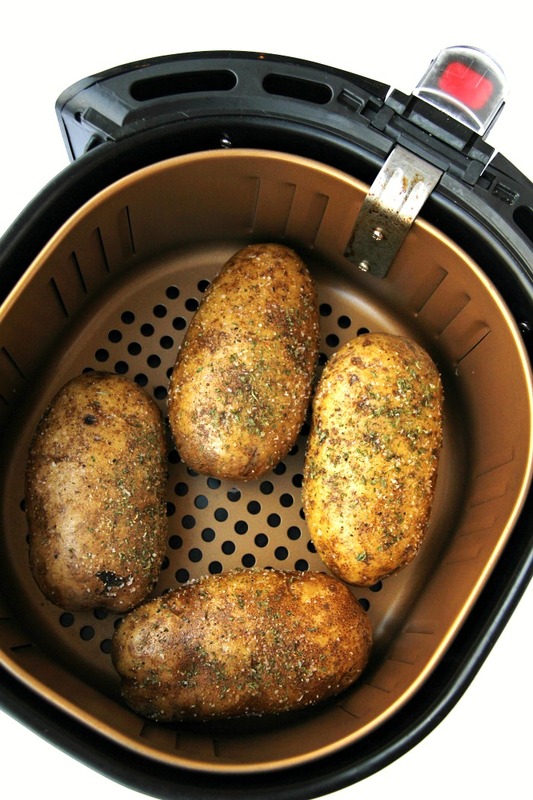 Would love more recipes for my hot air fryer. So glad you found us!! 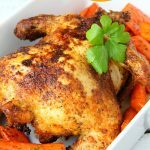 I have a new air fryer recipe going live tomorrow! So happy to have you as part of our community! Hi Hilary! I hope you continue to follow along with Bitz & Giggles. I just posted a new air fryer recipe last week for corn on the cob! Do you have a recipe for fingerling potatoes please? In my air fryer now! Yes, 400º Fahrenheit. This is a standard temperature for our air fryers in the U.S.
Hmmm. It just may be that your air fryer cooks a bit cooler. Try allowing them to cook a bit longer. Sometimes it takes some experimentation. You could also try using a fork to make some holes in the potatoes next time. You slice the potato to put the butter and sour cream when the potato is already cooked, am I right? Does time change for only 1 potato? No, it shouldn’t. Your best bet is to regularly check on the food during the air frying process. 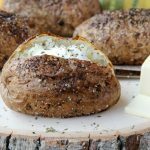 You can cook them in the microwave for 5 minutes, then the air fryer for 10 min will crisp up the skin, I LOVE crispy baked potato skin!